^ Paul Kretschmer. Die Griechischen Vaseninschriften ihrer Sprache nach untersucht. ^ Miller, Stephen Gaylord (1991). Arete: Greek Sports from Ancient Sources. University of California Press. p. 86. ISBN 0-520-07509-9. Cimon or Kimon was an Athenian statesman and general in mid-5th century BC Greece. He was the son of Miltiades, the victor of the Battle of Marathon, Cimon played a key role in creating the powerful Athenian maritime empire following the failure of the Persian invasion of Greece by Xerxes I in 480-479 BC. Cimon became a military hero and was elevated to the rank of admiral after fighting in the Battle of Salamis. One of Cimon’s greatest exploits was his destruction of a Persian fleet, in 462 BC, he led an unsuccessful expedition to support the Spartans during the helot uprisings. 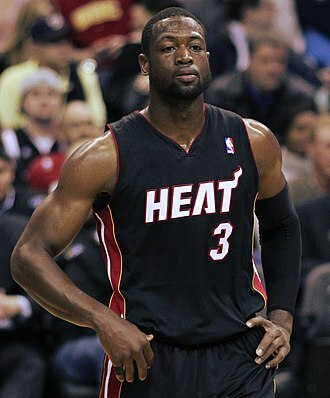 For this participation in policy, he has often been called a laconist. 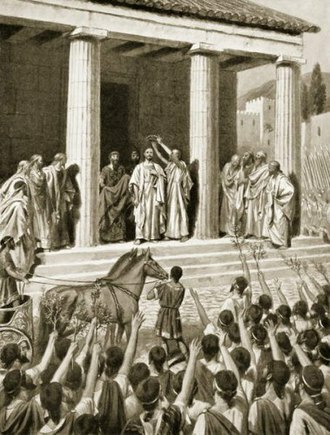 Cimon led the Athenian aristocratic party against Pericles and opposed the revolution of Ephialtes seeking to retain aristocratic party control over Athenian institutions. Cimon was born into Athenian nobility in 510 BC and he was a member of the Philaidae clan, from the deme of Laciadae. His grandfather was Cimon the Silly, who won three Olympic victories with his chariot and was assassinated by the sons of Peisistratus. 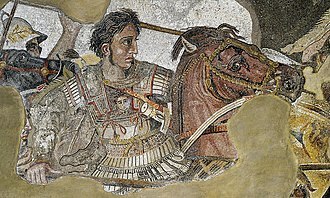 His father was the celebrated Athenian general Miltiades and his mother was Hegesipyle, daughter of the Thracian king Olorus, while Cimon was a young man, his father was fined 50 talents after an accusation of treason by the Athenian state. As Miltiades could not afford to pay this amount, he was put in jail, Cimon inherited this debt and, according to Diodorus, some of his fathers unserved prison sentence in order to obtain his body for burial. 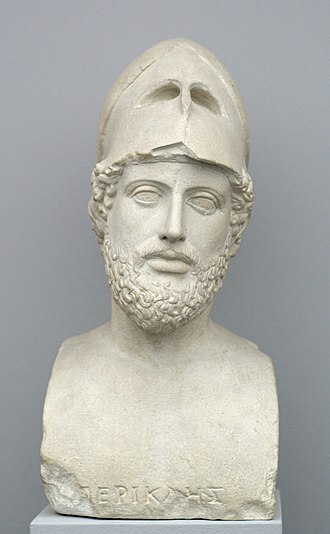 As the head of his household, he had to look after his sister or half-sister Elpinice, according to Plutarch, the wealthy Callias took advantage of this situation by proposing to pay Cimons debts for Elpinices hand in marriage. He married Isodice, Megacles granddaughter and a member of the Alcmaeonidae family and their first children were twin boys named Lacedaemonius and Eleus. During the Battle of Salamis, Cimon distinguished himself by his bravery and he is mentioned as being a member of an embassy sent to Sparta in 479 BC. Between 478 BC and 476 BC, a number of Greek maritime cities around the Aegean Sea did not wish to submit to Persian control again, they formed the Delian League, and it was agreed that Cimon would be their principal commander. Samothrace is a Greek island in the northern Aegean Sea. It is a municipality within the Evros regional unit of Thrace, the island is 17 km long and is 178 km2 in size and has a population of 2,859. Its main industries are fishing and tourism, resources on the island include granite and basalt. Samothrace is one of the most rugged Greek islands, with Mt. 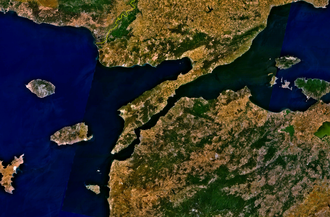 Saos and its tip Fengari rising to 1,611 m. Samothrace was not a state of any significance in ancient Greece, since it has no natural harbour and most of the island is too mountainous for cultivation. It was, the home of the Sanctuary of the Great Gods, among those who visited this shrine to be initiated into the island cult were Lysander of Sparta, Philip II of Macedon and Lucius Calpurnius Piso Caesoninus, father-in-law of Julius Caesar. The ancient city, the ruins of which are called Palaeopoli, was situated on the north coast, demetrios of Skepsis mention the Samothracian Mysteries. The traditional account from antiquity is that Samothrace was first inhabited by Pelasgians and Carians, at the end of the 8th century BC the island was colonised by Greeks from Samos, from which the name Samos of Thrace, that became Samothrace, Strabo denies this. The archaeological evidence suggests that Greek settlement was in the sixth century BC, the Persians occupied Samothrace in 508 BC, it passed under Athenian control, and was a member of the Delian League in the 5th century BC. It was subjugated by Philip II, and from till 168 BC it was under Macedonian suzerainty, with the battle of Pydna Samothrace became independent, a condition that ended when Vespasian absorbed the island in the Roman Empire in AD70. Apart from the sanctuary, decisive role in the great development of Samothrace played her two ports from which passed the sea road Troas - Macedonia. Furthermore, an important role played as well her possessions in Perea, st. Theophanes died in Samothrace in 818. 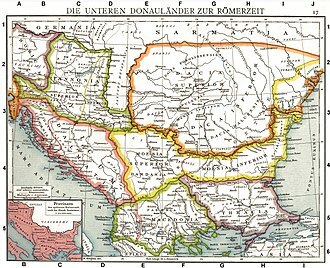 The Byzantines ruled until 1204, when Venetians took their place, only to be dislodged by a Genoan family in 1355, the island came under Greek rule in 1913 following the Balkan War. It was occupied by Bulgaria during the Second World War, from 1941 to 1944, the modern port town of Kamariotissa is on the north-west coast and provides ferry access to and from points in northern Greece such as Alexandroupoli and Kavala. Lysimachus no doubt made Lysimachia the capital of his kingdom, and it must have rapidly risen to great splendour and prosperity. After his death the city fell under Seleucid dominion, and during the wars between Seleucus Callinicus and Ptolemy Euergetes it passed from the hands of the Seleucids into those of the Ptolemies. Whether these latter set the free, or whether it emancipated itself, is uncertain. 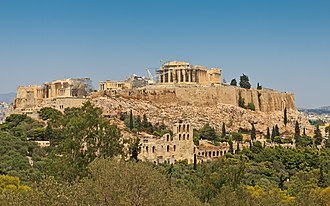 In 287 BC, the city was damaged by an earthquake. In 277 BCE near Lysimachia the Macedonian king Antigonus II Gonatas defeated the Gauls, as the Aetolians were not able to afford the town the necessary protection, it was destroyed again in 197 BCE by the Thracians during the war of the Romans against Philip of Macedonia. Antiochus the Great restored the place, collected the scattered and enslaved inhabitants and this restoration, appears to have been unsuccessful, and under the dominion of Rome it decayed more and more. The last time the place is mentioned under its ancient name, is in a passage of Ammianus Marcellinus, the emperor Justinian restored it and surrounded it with strong fortifications, and after that time it is spoken of only under the name of Hexamilion. Hipparchia of Maroneia was a Cynic philosopher, and wife of Crates of Thebes. She was born in Maroneia, but her family moved to Athens, where Hipparchia came into contact with Crates and she fell in love with him, despite the disapproval of her parents, she married him. She went on to live a life of Cynic poverty on the streets of Athens with her husband, the story of her attraction to Crates, and her rejection of conventional values, became a popular theme for writers. Hipparchia was born c.350 BC in Maroneia and her family came to Athens, where Hipparchias brother, became a pupil of the Cynic philosopher Crates of Thebes. Hipparchia fell in love with Crates, and developed such a passion for him and they begged Crates to dissuade her, and he stood before her, removed his clothes, and said, Here is the bridegroom, and this is his property. Hipparchia, was happy with this, she adopted the Cynic life assuming the same clothes that he wore. Hipparchia had at least two children, a daughter, and a son named Pasicles and it is not known how or when she died. A genus of butterflies, bears her name, the Suda says she wrote some philosophical treatises, and some letters addressed to Theodorus the Atheist. Theodoros hitting himself does not do wrong, nor does Hipparchia do wrong hitting Theodoros and he did not reply to what she said, but pulled up her garment. We are told she was neither offended nor ashamed by this as most women would have been and we are told that when Theodorus said to her, Who is the woman who has left behind the shuttles of the loom. She replied I, Theodorus, am that person, but do I appear to you to have come to a decision, if I devote that time to philosophy. Many other anecdotes existed about Hipparchia, but they have mostly lost. Hipparchias fame undoubtably rests on the fact that she was a woman practising philosophy, both facts were unusual for ancient Greece or Rome. Although there were women who chose to live as Cynics. She is the woman to have her own entry among the 82 philosophers in Diogenes Laërtius Lives and Opinions of Eminent Philosophers. Leander fell in love with Hero and would swim every night across the Hellespont to spend time with her. Hero would light a lamp at the top of her tower to guide his way, succumbing to Leanders soft words and to his argument that Aphrodite, as the goddess of love, would scorn the worship of a virgin, Hero allowed him to make love to her. Their trysts lasted through a warm summer, but one stormy winter night, the waves tossed Leander in the sea and the breezes blew out Heros light, Leander lost his way and drowned. When Hero saw his body, she threw herself over the edge of the tower to her death to be with him. Leander has been unable to swim across to Hero in her tower because of bad weather, her summons to him to make the effort will prove fatal to her lover, musaeuss poem had early translations into European languages by Bernardo Tasso, Boscán and Clément Marot. Chapmans 1616 translation has the title The divine poem of Musaeus, translated according to the original, by Geo, Chapman. Staplyton, the mid-17th century translator, had read Scaligers repudiation of this mistaken belief, renaissance poet Christopher Marlowe began an expansive version of the narrative. Sir Walter Ralegh alludes to the story, in his The Oceans Love to Cynthia, in which Hero has fallen asleep, and fails to keep alight the lamp that guides Leander on his swim. Shakespeare mentions this story in the scene of Two Gentlemen of Verona. PROTEUS, Upon some book I love Ill pray for thee, VALENTINE, Thats on some shallow story of deep love, How young Leander crossd the Hellespont. PROTEUS, Thats a deep story of a love, For he was more than over shoes in love. VALENTINE, Tis true, for you are over boots in love and Leander are again mentioned in Two Gentlemen of Verona in Act III Scene I when Valentine is tutoring the Duke of Milan on how to woo the lady from Milan. But these are all lies, men have died from time to time and worms have eaten them, ben Jonsons play Bartholomew Fair features a puppet show of Hero and Leander in Act V, translated to London, with the Thames serving as the Hellespont between the lovers. Myths and Hymns, by Adam Guettel, contains a song titled after the pair, robert Schumann is said to have perceived his In der Nacht from Phantasiestücke as depicting the story of Hero and Leandros. Stephen of Byzantium, known as Stephanus Byzantinus, was the author of an important geographical dictionary entitled Ethnica. Of the dictionary itself only meagre fragments survive, but we possess an epitome compiled by one Hermolaus, not otherwise identified. Nothing is known about the life of Stephanus, except that he was a grammarian at Constantinople, and lived after the time of Arcadius and Honorius, even as an epitome, the Ethnica is of enormous value for geographical and religious information about ancient Greece. 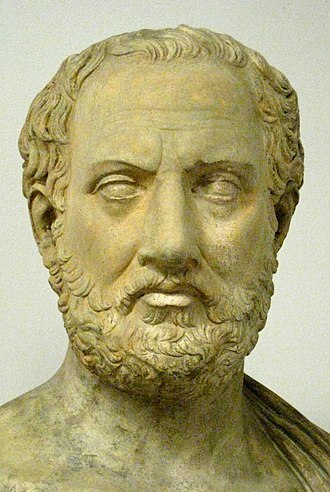 Nearly every article in the epitome contains a reference to some ancient writer, Stephanus cites Artemidorus, Aelius Herodianus, Thucydides, Xenophon and other writers. The chief fragments remaining of the work are preserved by Constantine Porphyrogennetos, De administrando imperio, ch.23 and De thematibus. 10, the latter includes a passage from the comic poet Alexis on the Seven Largest Islands, another respectable fragment, from the article Δύμη to the end of Δ, exists in a manuscript of the Fonds Coislin, the library formed by Pierre Séguier. The first modern printed edition of the work was published by the Aldine Press in Venice,1502. The complete standard edition is still that of Augustus Meineke, and by convention, a new completely revised edition in German is in preparation, edited by B. Zubler, M. Billerbeck, J. F. Gaertner,2006 onwards, google Books Guilielmus Xylander,1568, Στέφανος. Google Books Claudius Salmasius and Abraham van Berkel,1688, Στεφάνου Βυζαντίου Ἐθνικὰ κατ ἐπιτομήν Περὶ πόλεων = Stephani Byzantini Gentilia per epitomen, google Books Lucas Holstenius,1692, Notae & castigationes in Stephanum Byzantium De urbibus. Google Books Thomas de Pinedo,1725, Stephanus de urbibus, google Books Karl Wilhelm Dindorf,1825, Stephanus Byzantinus. Incorporating notes by L. Holsteinius, A. Berkelius, and T. de Pinedo, google Books Anton Westermann,1839, Stephani Byzantii ethnikon quae supersunt. Google Books Augustus Meineke,1849, Stephani Byzantii ethnicorum quae supersunt, google Books Margarethe Billerbeck et al. Berlin/New York, Walter de Gruyter, This article incorporates text from a now in the public domain, Hugh. Antisthenes was a Greek philosopher and a pupil of Socrates. 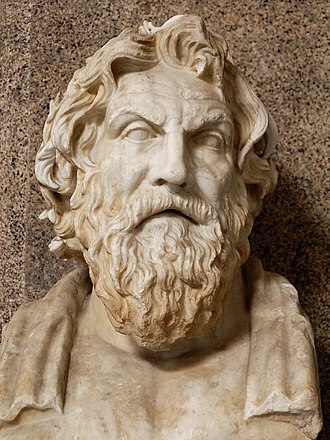 Antisthenes first learned rhetoric under Gorgias before becoming an ardent disciple of Socrates and he adopted and developed the ethical side of Socrates teachings, advocating an ascetic life lived in accordance with virtue. Later writers regarded him as the founder of Cynic philosophy, Antisthenes was born c.445 BC and was the son of Antisthenes, an Athenian. In his youth he fought at Tanagra, and was a disciple first of Gorgias and he never forgave his masters persecutors, and is said to have been instrumental in procuring their punishment. He survived the Battle of Leuctra, as he is reported to have compared the victory of the Thebans to a set of schoolboys beating their master. He is said to have lectured at the Cynosarges, a gymnasium for the use of Athenians born of foreign mothers, Diogenes Laërtius says that his works filled ten volumes, but of these, only fragments remain. His style was pure and elegant, and Theopompus even said that Plato stole from him many of his thoughts, after reading some works by Antisthenes, found his works pleasing and called him a man more intelligent than learned. Two declamations have survived, named Ajax and Odysseus, which are purely rhetorical, and he held virtue to be sufficient in itself to ensure happiness, since it needed nothing else except the strength of a Socrates. Antisthenes was a pupil of Socrates, from whom he imbibed the fundamental ethical precept that virtue, everything that the wise person does, Antisthenes said, conforms to perfect virtue, and pleasure is not only unnecessary, but a positive evil. He is reported to have pain and even ill-repute to be blessings. The supreme good he placed in a life lived according to virtue, – virtue consisting in action, which when obtained is never lost, and exempts the wise person from error. It is closely connected with reason, but to enable it to itself in action. His work on Natural Philosophy contained a theory of the nature of the gods, in which he argued there were many gods believed in by the people. He said that God resembles nothing on earth, and therefore could not be understood from any representation, in logic, Antisthenes was troubled by the problem of universals. 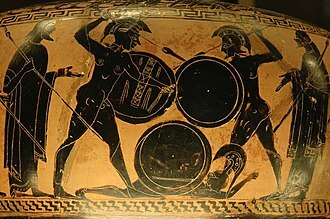 G.
Greek wrestling, known as Ancient Greek wrestling and Palé, was the most popular organized sport in Ancient Greece. A point was scored when one player touched the ground with his back, hip or shoulder, three points had to be scored to win the match. One particularly important position in this form of wrestling was one one of the contestants was lying on his belly with the other on his back trying to strangle him. The athlete on the bottom would try to grasp an arm of the one on top, Wrestling was the first competition to be added to the Olympic Games that was not a footrace. The competitions were held in elimination-tournament style until one wrestler was crowned the victor, the wrestling area was one square plethron or stremma. This event was part of the pentathlon. 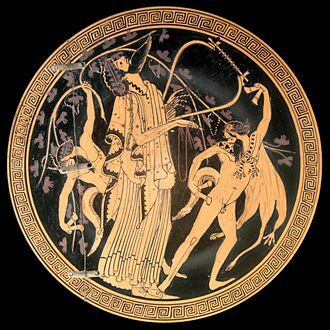 Wrestling was regarded as the best expression of strength out of all of the competitions and was represented in Greek mythology by Heracles, milo of Croton was one of the most famous wrestlers from this ancient time period. At one set of games, no one challenged him, but as he walked to the skamma he slipped and he contested that he should be crowned because he had only fallen once, two short of the required at least three times. Coinage of Miltiades in Thracian Chersonesos. Lion, head left, raising left forepaw, tail curled above. Head of Athena, wearing crested Attic helmet and earring, within incuse square. Circa 495-494 BC. Miltiades, Roman copy of 5th century original. 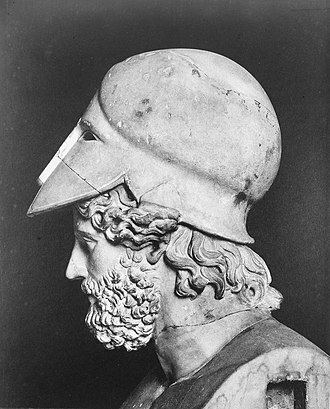 "Helmet of Miltiades". The helmet was given as an offering to the temple of Zeus at Olympia by Miltiades. Inscription on the helmet: ΜΙLTIAΔES. Archaeological Museum of Olympia. His helmet read Miltiades dedicates this helmet to Zeus. Roman wall painting of Hipparchia and Crates from the Villa Farnesina, Rome. 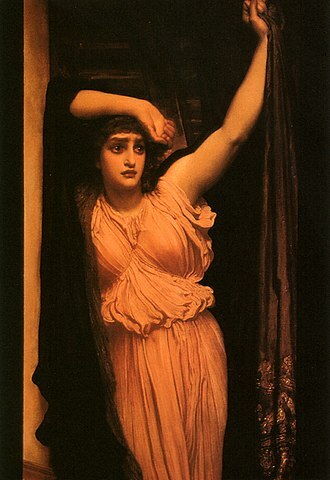 Hipparchia approaches Crates carrying a box, implying that she has come to Crates as a potential bride bearing her possessions. Hoplites on a globular aryballos from Elaeus. Statue of Mustafa Kemal Atatürk in Marmara Ereğlisi. Roman copy of Boethus' sculpture of a boy playing with a goose.